Iona remind me of a Turner painting, capturing the experience of awe and grandeur with their sound without wasting energy on simplistic caricature of the ideas involved. 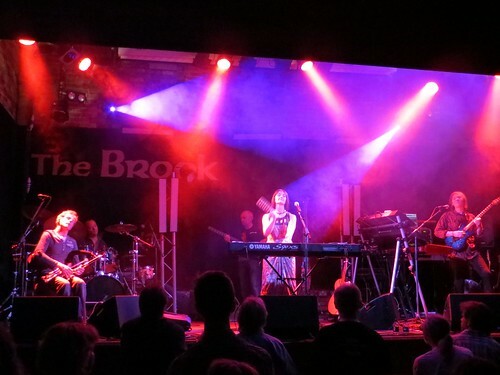 Band founder Dave Bainbridge admitted to being a prog-rock fan when challenged by an audience member mid-set, and indeed Iona’s musical style has always verged on prog-rock without quite reaching that extreme, cutting things short enough to reach the bliss without hitting the boredom. I chatted with Dave last night and asked him about his decision to make the band’s best-of album available as a free download. He told me that the goal is to build the mailing list and fan-base. I’m always delighted to find a band that takes responsibility for its own affairs rather than trying to blame “pirates” (AKA fans you’re not serving properly, in the main) so this seems a worthy goal; go sign up for the list and get their (magnificent) album “Treasures” completely free of charge. That “taking responsibility” also extends to their new music. The best way to get their new album “Another Realm” is to visit their web site, where there’s a full-function international shop that as well as selling CDs also offers audiophile-quality digital downloads. It’s on Amazon too, of course, but I also respect a band that’s looking after itself online this well.